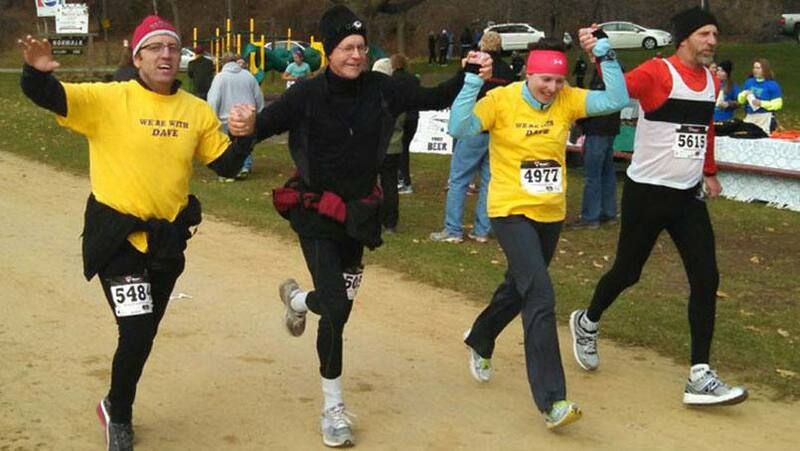 Dave Eitrheim, M.D., wouldn't let dying stop him from living. After Dr. Eitrheim, a longtime physician at Mayo Clinic Health System — Red Cedar in Menomonie, Wisconsin, was diagnosed with terminal cancer, he continued to do what he'd always done. As we wrote previously, that included running marathons and ultramarathons, which had always been an important part of his life. He also wrote. A lot. And well. His weekly Caring Bridge posts have been viewed more than 80,000 times, a testament to the inspiration and comfort his words provided. After many of Dr. Eitrheim's readers suggested he turn his journal entries into a book, "he was convinced that a book could be helpful to his patients and others who walk through hard times," according to the foreword to "The Race of My Life: 50 Essays on Living With Cancer." As his obituary fittingly put it, Dr. Eitrheim completed that race on Jan. 1, 2016, just six days before the book published. Now Dr. Eitrheim's wisdom will reach a new audience. As the Eau Claire Leader-Telegram reports, the book was chosen as this year's selection for Menomonie Reads, Menomonie Public Library's annual community-wide reading program. "We can all put ourselves in his shoes," Tim Fitzgerald, adult services department head at the library, tells the paper about the selection. "How would we spend the last few days of our life?" Helping people answer that question was one of Dr. Eitrheim's goals. "Dave was hopeful that people reading the book would begin conversation with loved ones about their wishes for end-of-life care," his wife, Amy Eitrheim, tells us. "Making your choices known ahead of a medical catastrophe can alleviate angst, pain and confusion for family members." To that end, Menomonie Reads events will include a showing of Being Mortal, a PBS Frontline documentary about end-of-life care, and a panel discussion on advance directives. The library will also host an introduction to the Free Clinic of the Greater Menomonie Area (where Dr. Eitrheim was a dedicated volunteer), a community run/walk (a nod to one of Dr. Eitrheim's passions), and book discussions. When we get to the point where enjoying the success of others is more important than our own success, we find our greatest joy. We should cherish the thought that our lives live on in those whom we have touched in meaningful ways. Our acts of kindness, generosity, faith and love towards others don't go unnoticed. Instead, they are the greatest inheritance that our friends and family can receive. Amy tells us her husband "would likely have been surprised, but pleased" to know his book was selected for Menomonie Reads. "Dave was at peace and hopeful, even as he faced death," Amy says. "If this book helps people in any way, then his legacy of healing goes on. I think that's awesome." Indeed. You can leave a legacy of your own by posting a comment below. Then, use the handy social media tools atop this page to share this story with others.